China announced on Thursday that its new intermediate-range ballistic missile capable of precision strikes against land- and sea-based targets has been deployed with the People's Liberation Army (PLA) Rocket Force, a move hailed by Chinese observers as part of the country's warning to Taiwan secessionists and aircraft carriers-powered US forces behind them. 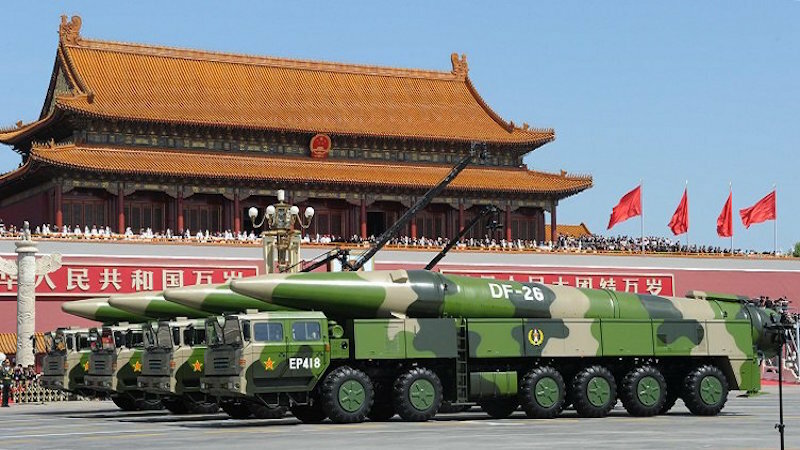 The Dongfeng-26 ballistic missile has officially joined the combat sequence of the PLA rocket force after tests, Wu Qian, the Chinese defense ministry spokesperson, confirmed at a regular press briefing on Thursday, according to the Ministry of National Defense website. The domestically-developed weapon is China's new generation intermediate-range ballistic missile capable of not only swift nuclear counterattacks but also precision strikes on medium and large targets on land and sea, Wu said. Dongfeng-26 can be loaded with conventional missiles or nuclear warheads, Global Times previously reported. It is a weapon "customized for supersized US aircraft carriers and amphibious assault ships," as the US is evidently behind Taiwan secessionists and Washington is interfering in resolving the Taiwan question, Song Zhongping, a military expert and TV commentator, told the Global Times on Thursday. The surprise announcement came amid a "sensitive period," and together with PLA's war games since April 18 it sends a clear warning that the US should act cautiously on the Taiwan question and not interfere in China's internal affairs as China is capable of dealing with the US-Japan military alliance, Song noted. Wu also reiterated China's non-first-use principle of nuclear weapons and that China sticks by its nuclear policy of self-defense and minimum deterrence. “The newly commissioned weaponry of the Rocket Force is Dongfeng-26 missile. After the trial and operational test, this type of missiles are ready to be equipped to the full establishment of unit and have since then been officially commissioned to the Rocket Force. “As a new generation of medium-and-long range missile, DF-26 has the following 4 features: first, it is researched, developed and manufactured by China independently and we have complete property right over it. “Second, it can carry both conventional and nuclear warheads, capable of both rapid nuclear counter-strikes and conventional medium-and-long range precision strikes. “Third, it is capable of launching precision strikes at both critical target on land and medium- and large-sized vessels at sea. BEIJING --- The People's Liberation Army (PLA) has commissioned Su-35 fighter jets, Wu Qian, spokesperson for China's Ministry of National Defense, said Thursday. As a multi-role fighter jet, the Su-35 is capable of precision strikes on ground and sea targets, Wu said at a press conference.